When people are arrested, tried, or imprisoned for tax resistance, their comrades have sometimes used this as an occasion to hold rallies or other demonstrations. This shows support for the people being persecuted, demonstrates determination in the face of government reprisals, and can be a good opportunity for propaganda. 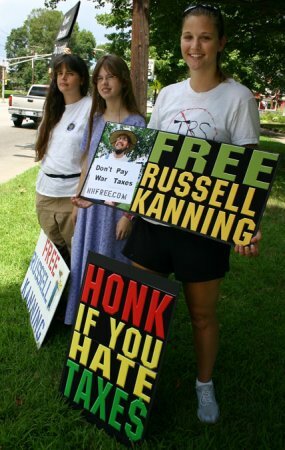 When Russell Kanning was convicted for leafletting at the IRS office in Keene, New Hampshire, supporters demonstrated at the jail, holding up “Free Russell Kanning” signs. Sylvia Hardy, an elderly woman from Exeter, refused to pay her council tax, calling it highway robbery that the tax rates have risen by double-digits per year, while her pension rises at only 1.7% annually. When she was summonsed to court, she walked alongside banner-waving supporters and was met by a crowd of supporters outside the courthouse. Another pensioner who refused to pay his council tax bill for similar reasons, David Richardson, was taken to court in 2004 . About fifty supporters demonstrated outside, singing “For He’s a Jolly Good Fellow,” for Richardson. Brian Wright was the first person imprisoned for failure to pay Margaret Thatcher’s “Poll Tax” — 700 people held a rally outside the prison to show support. Other prisons holding poll tax resisters were later picketed by protesters. When J.J. Keon, a Socialist from Grafton, Illinois, was jailed for refusing to pay what he contended was an illegal poll tax in 1910 , Socialist Party spokesman Ralph Korngold came to town and gave a speech outside the prison urging people to join Keon in resisting and to ask why no rich tax dodgers were behind bars. Maurice McCrackin was jailed for war tax resistance in 1958 . 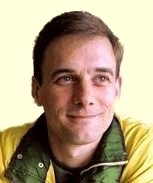 While there, war tax resister Richard Fichter picketed the federal prison camp where he was held. Before that, he’d picketed the courthouse where McCracken was being tried. When the IRS took war tax resister Ed Hedemann to court in 1999 to try to force him to turn over financial documents to the agency, some 25 supporters, waving signs and handing out leaflets, joined him to demonstrate outside the courthouse before the hearing. When Clemence Housman was jailed for failure to pay about $1 of tax in 1911 — with the authorities telling her that they were authorized to keep her in jail until she paid up, however long that took — the Women’s Tax Resistance League held a protest outside the prison, and “gave three rousing cheers for Miss Housman, which… it is hoped reached the lonely prisoner in her cell.” The league then organized a procession to the prison gates. The four mile walk, over muddy streets on a rainy day, ended in a surprising victory, as the government had thrown in the towel and released Housman — without getting a penny from her — after five days. The Women’s Tax Resistance League organized “a great gathering” to support Kate Harvey who was charged with ten counts of failing to pay national insurance taxes on her gardener’s salary. Following the sentence, they shouted “Shame!” to the judge, then held a “poster parade” to the town square and held a mass meeting there. Poll tax resistance by American socialists a century ago, and by Indian Bhats a century and a half ago.